1 of 5 Heat oven to 350 degrees . Coat a 13 x 9 x 2-inch baking pan with nonstick cooking or baking spray. 2 of 5 Cake. Prepare cake mix with 1 1/4 cups water, the eggs and oil as per package directions. Transfer batter to prepared pan. Bake at 350 degrees for 31 to 33 minutes, or as per package directions. Cool completely. 3 of 5 Trim crowned area from top of cake; reserve scraps for later use. Invert cake onto serving platter. 4 of 5 Frosting and decorations. Place chopped chocolate in a medium bowl. Heat cream in a glass measuring cup in microwave for 1 minute. Pour over chocolate and let stand 5 minutes. Whisk until smooth. Let cool an additional 5 minutes. 5 of 5 Transfer 1/2 cup of the chocolate mixture to a pastry bag or resealable plastic bag. Pour and spread remaining frosting over cake, allowing some to drip down cake sides. Snip a small corner from plastic bag. Pipe decorations onto cookies. Let dry. 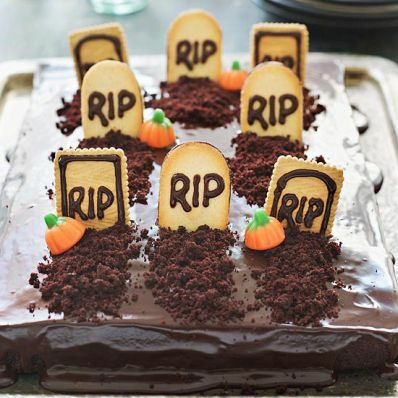 With a knife, cut slits into cake and insert decorated cookies into slits. Crumble reserved cake scraps and place on cake in front of cookies. Scatter pumpkin candies over cake.